There are two main things we look for in food – energy and nutrients. For the majority of our evolution, energy was the issue. We adapted to make use of a wide variety of foods to cover our needs and survive until reproductive age. We preferred high calorie, low toxin foods that required the least effort to get. We are still hardwired that way but our environment has changed. If you are reading this at home or at work, chances are that something calorie dense is within arm’s reach. Food has become hyper available, yet nutrient deficiencies are still an issue. Why is that? To clarify, there are two types of nutrients: macro-nutrients (carbohydrates, fats, proteins) and micro-nutrients (vitamins, minerals). Carbohydrates and fats are important, but with the exception of two fatty acids, our bodies can manufacture them if the overall energy intake is sufficient. With micro-nutrients and certain amino acids, our body has to rely on food intake. And if our bodies don’t get enough of these regularly, we start to perform worse, feel tired and hungry more often, and most importantly, we are more likely to develop all kinds of illnesses. The problem is not that there are no foods rich in these essential nutrients, we just don’t actively look for them and base our meals around them. It is clear that the odds are stacked against us. Supermarkets are filled with unhealthy choices and most restaurants focus on taste and price alone. But I don’t look at that as an excuse to give up. I take it as a challenge, and try to make every meal as nutrient dense as I can. While I am not a big fan of thinking about food in terms of calories, I like the phrase “empty calories”. It emphasizes that certain foods bring very little to no micro-nutrients along with the energy they provide. That does not mean they are inherently harmful, it just means eating them is a wasted opportunity to nourish our bodies. Before you look at the chart below, there is one thing to consider – bioavailability. It refers to the portion of a nutrient that is absorbed by the body. For example, nutrients in animal products will, in most cases, be highly bioavailable because they are already in the chemical structure our bodies use. On the other hand, plant matter often contains a lot of cellulose that we cannot digest, and that prevents us from absorbing all the vitamins and minerals it has to offer. 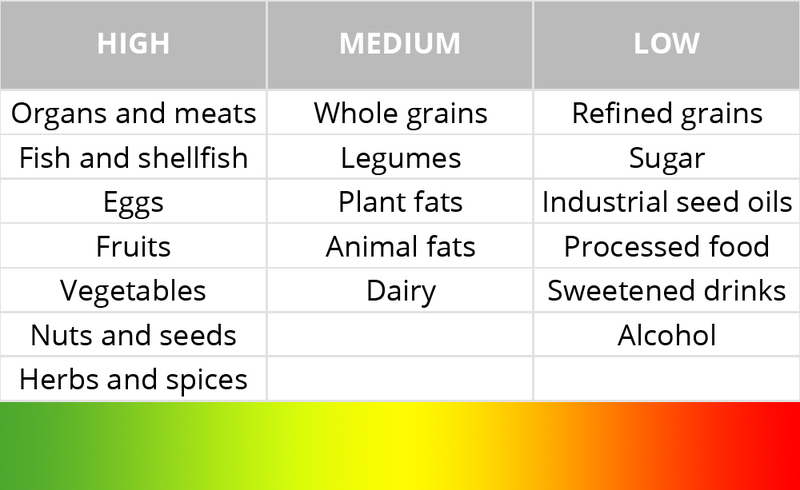 With this in mind, let’s see how different food groups fare. The first thing you can see is that wholesome, real foods are among the most nutrient dense, while processed foods are on the opposite end of the spectrum. Ok, I won’t beat this dead horse any longer. Instead, let me explain why staples such as legumes and grains are somewhere in the middle. The main issue is that they contain anti-nutrients, which impair absorption of some of the nutrients they carry. Traditionally living populations who ate a lot of them spent significant energy trying to break down these nutrient inhibitors to mitigate their unwanted effects. They would use methods like soaking, sprouting, fermenting or leavening, which you should do too, if you want to include them in your diet on a regular basis. Fats and oils are quite the opposite. While they are not especially rich in essential nutrients, they actually help us absorb them, especially fat soluble vitamins A, D, E and K. That’s why they are in the middle too. 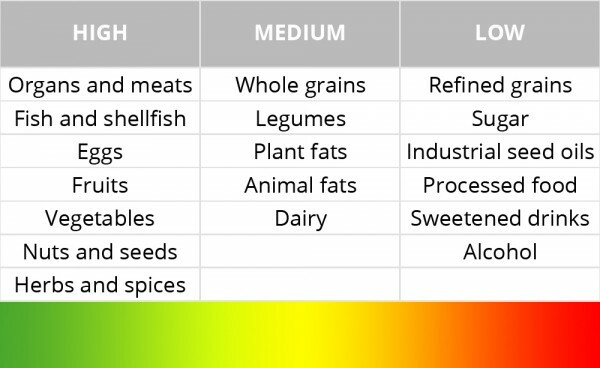 To sum up, choose items from the first column and avoid those from the third and you will get the most bang (meaning bioavailable essential nutrients) for your buck (meaning your meal). Let a well-nourished body be thy reward. Be sure to also read the FIRST, SECOND and THIRD part of our cycling food special by nutrition specialist Jiří Kaloč. Belgian Exhibition Brings Cycling into the Future!